As I understand, this year marked the 5th edition of the Ride around the Lake. It is a charity event that challenges cyclists to complete a loop of nearly 300km around Lake Nipissing over two days. This year was the first year that I would be able to complete the entire loop as past years have seen me unable to enter or just do the second day. 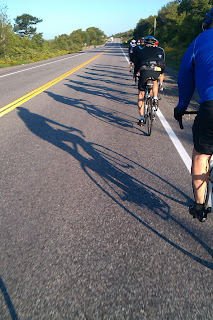 This year's event had thirteen cyclists start out for Sturgeon Falls which was the first "rest stop". We left North Bay at 7:00 am on Saturday (Aug. 24th). This early start ensured the traffic on HWY 17 is relatively low for us to travel safely. When we arrived in Sturgeon we rolled into the Tim Horton's parking lot (the smaller of the two venues and the one on the right side when entering town from North Bay) where we were joined by an additional rider. After some refreshments we left Sturgeon Falls and our peloton of fourteen cyclists maneuvered through town headed towards Noelville where we would have another "rest stop" before continuing onto Alban. We would enjoy a few more "rest stops" along the way before reaching our destination in Alban. 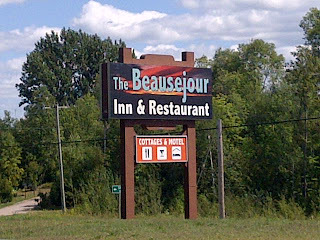 Once in Alban we would spend the night at the Beausejour Inn & Restaurant. The journey up to this point had taken us some 116km part way around Lake Nipissing. As we arrived at the Beausejour Inn in the early part of the afternoon there was time to enjoy some "liquid libations" before refuelling at dinner for the coming day's ride! The next day, which was Sunday (Aug. 25th), saw us departing the motel around 8:00am and head towards HWY 69 where we would have breakfast at the the Hungry Bear Restaurant. After breakfast we continued along HWY 69 until we reached HWY 522 where we turned in and began heading towards Port Loring. We had a good tailwind as we rode along on HWY 522 and made good time as my average speed along this section was 27kph. Once we reached Port Loring it wasn't much further to our next rest stop where we had lunch and a surprise visit from Denis' inlaws (Sue and Rob) along with Denis' spouse, Amy who is also a Burnt Helmets team member along with their son, Nolan who is currently the youngest Burnt Helmets member. As we prepared to depart and tackle the remaining 80km, which takes us thru Golden Valley, Restoule, and Nipissing Village, it began to rain. As we continued along our route the rain steadily increased until it was a downpour. This was somewhat tolerable but does make riding as a group difficult as riding directly behind another cyclist only results in a continuous spray of water in your face along with being rained on. We also began encountering some tough hills that started to break the group up. It was not long before I found myself riding alone thru these hills separated from the others for quite a while. It is times like these that force one to dig deep and not give up as it was sometime before I was able to drag myself onto the back wheel of two other riders. By then we were on HWY 654 and into the final leg of the journey. At the final "rest stop", known as the Wasi Lookout, we took a group photo before continuing thru Callander and onto the Kate Pace Way as we arrived back in North Bay finishing our Ride around the Lake with a total distance of 285km. As always, thanks for spending your 30 seconds with Scott! Even though vacation calories are flooding in like a broken dam failing to hold back a lahar of thick maple syrup with cakes, chips and meat sticks, one must get out on the bike. Maybe not for the futile effort to loose a pound a day vacation fat but to see the sites and enjoy the breeze. Maybe this will justify the juicy butter tart that got left behind in my figurative mental dam failure. Well we have our site set up. Now its time to relax the pre ride. ... And there off without a bang! Seems like a quiet start to the 2013 race season. Life's little activities seem to be creeping in pulling out attention and perhaps some enthusiasm out of racing. 2012 wasn't so much injury plagued but did take its toll on everyone. On a specific note for theMacs, our adoption plans are moving forward and 2013 finally looks to be the year. If you're interested you can find more information here on my wife's blog about our pending journey. This weekend will mark the first official entrance by a BH team member into an Ontario Cup road race! Dave, apparently, has been talking about doing a road race for a few years and Jenn has called him on it essentially forcing him (that would be Dave) to MAN UP! 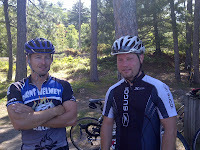 So, plus 1 for Dave for registering for the Lake of Bays Road Race. I know I'll be looking forward to your race report. As for the remaining team members, looks like this weekends Saturday Group Road Ride will be in the cards. For those not already in the know, I became a certified SPIN instructor last Fall and have been regularly instructing at the CFB North Bay Recreation Centre. I was to have been instructing this Saturday (which was to be my last Saturday for the Summer), however, there is also a Cadet Marching Band competition being held at the Rec-Centre and they require the extra space (that being the SPIN room) for staging the competitors as they prepare to march about the Gym being judged. Fortunately, the forecast, having been up and down all week now looks promising with cloudy but rain free weather predicted. Looking forward on the race schedule the next race is the 24hrs of Summer Solstice on June 22nd/23rd. This is a full team event with Dan, Derek, Denis, Amy, Dave and myself. Unfortunately, without a 2nd female rider we won't qualify as "mixed" and thus be competing in an all male category. Perhaps we can convince Dan to add a few letters to his name... we could introduce him as Daniella! Hmm, maybe not. Thanks for spending your 30 seconds with Scott! ... And now for the rest of the story. Yes, we are well into the offseason now. This past race season saw the Burnt Helmets in three Ontario Cup races, one 24hr race, a team triathlon, a two-day tour around lake nipissing (just under 300km), and what was likely the last Crank the Shield as Chico Racing has reposition itself and will no longer be solely focused on Mountain Bike racing. Anyway, back to recaping the last two events this past season. My 'ride around the lake' was shortened to a one-day 'out and back' as my Cousin got married on the Saturday and I did not want to miss the big event. So myself and two others left from North Bay and rode out, in some of the worst wet and raining conditions I might add, to meet up with the group just west of Golden Valley at a road side picnic and rest stop. Fortunately, by the time we arrived the weather had changed dramatically and it was sunny and warm - which helped dry us off. Much to our dismay the group hadn't encountered any bad weather following their early morning departure from their overnight stay at the Beausejour Inn and Restaurant in Alban, Ontario. On arriving at the rest stop, we had about 20 minutes to eat and prep as we were soon on our way back towards North Bay. This would be my first 160km (a.k.a. Century Ride) road ride. Now, I have ridden this same 'out and back' route several times in the past as Amy's parents have a Cottage out that way. However, this would be the first time I've ridden out in back the same day. It was a tough day nonetheless, especially since I lost contact with the group and missed the final rest stop before reaching North Bay. Regardless, it would prove to be a good warm-up to what was to come in September for Crank the Shield. Going forward about one month, we are prepared for our 2nd time entering the Crank the Shield race... and what would be my 1st time racing the full length course. We arrived on the Thursday afternoon at the course, a beautiful fall day, to pickup our race kits and in addition each of us purchased a 2012 Crank the Shield jersey - at the time not knowing it would be the last CTS. We enjoyed fantastic company and a great dinner with Gary, an old roomate of Deny's from college. Gary was also kind enough to put us up for the night as he resides in Haliburton which is quite near the race's start at the Haliburton Forest. Race Day#1 morning saw a continuous light drizzle of rain, just enough to be annoying. The start of the race seemed to drag as we had to gear up in the rain and stand around waiting for 11AM and the official race start. There was the typical build-up to the start, but as with most distance races the "GO" is somewhat anti-climatic. Following the long gravel road towards the the entrance to the singletrack, the hope was the field would thin out before reaching the singletrack that might present as a bottle-neck. For the most part it worked, the bottle-neck was lessened but the course would take a beating as a result of that continuous light rain. The hours seemed to blur together as the afternoon progressed and when I crossed that finish line on the first day moments before 5:30pm - I have never been so glad to see the end. Dave and Denis were there to greet me, having had time to freshen up and change their clothes. Having seen my ease with 'Rockstar Service' during our previous entry in Crank the Shield, both Dave and Denis joined me this year and what a blessing it was! Unfortunately, there would be a casuality that first day... my Chamois Bike shorts. Having spent much of the day in wet weather the chamois material and shorts separated resulting in my ripping the bottom of them at somepoint during that afternoon - oh, well it would be easy cleaning as I tossed them into the trash. Race Day#2 was a little dryer and would prove to be a warmer yet equally gruelling day in the saddle. A total of 80km consisting of a mix of singletrack, fire road, and paved road. The start was a short 1km doubletrack section before jumping into singletrack and an instant bottle-neck. As the field thined the course began to flow. Again it challenged me with singletrack obstacles and features. I made my way thru the course refueling at each aide station along the way and was able to enjoy the beautiful vistas as the afternoon brought the sun which warmed things dramatically. Late afternoon came as I neared the finish. I had been on the heels of a small group of riders for about the last 10km and in the final 2km I caught them. Pushing thru I managed to cross the line in front of three of them. Yet another long day in the saddle as I would again cross the line just before 5:30pm. Race Day#3 was cold and frosty. The race itself was beginning to take its toll on me. The ride to the start we'd learned from previous was about 13km and gruelling it would be as keeping a balance between quickly ticking off the kilometres and fighting the windchill would be difficult. Arriving at the start, there was ample time to warm body parts and prepare for the final day's race. I guess it was either the earlier morning start or maybe the windchill froze my brain, but somehow I neglected to take a five-hour energy booster before the start and I was one hour into the race before I realized something wasn't right. At the first opportunity I took the five-hour booster but it would still be rough as it took time to take effect. At this point, I could already feel the tiredness taking over. Even the thought of the boost from the caffine in the five-hour wasn't enough motivation to want to continue, but I pushed onward. It was another hard hour before I started to feel positive as the five-hour gave me energy and I came to feel alert again. Continuing to push forward I could hear the loudspeakers from the finish area in the distance. The singletrack had us looping back and forth for what seemed like hours until finally breaking out onto the fire road that led to the finish line. Unknown to me at the time, my Mom and In-laws in addition to my wife (the only one whom I knew was to come) had made the journery from North Bay. As well, both Jenn and Amy (along with little Nolan) would also make the trip to see Dave and Denis finish. Unfortunately, after waiting for my arrival for sometime my Mom and Inlaws had to leave. As luck would have it, this was only a short time before I would final cross the finish line (just before 3:30pm) and complete the race. 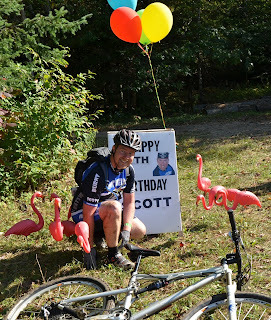 I have to say, it was quite an adventurous way to celebrate my 40th birthday! Now I'm sure you're asking yourself, "How come it took so long to update us?". Yes, well... It has taken a long time to recover fully from Crank the Shield. As well, my interests shifted a little this fall and many of you might also know that I've recently become a certified Spin Instructor and teach weekly classes up at the CFB Fitness Centre.